An abundant game bird in colonial times, the wild turkey was so well thought of that it was considered a choice for our national emblem along with the bald eagle. 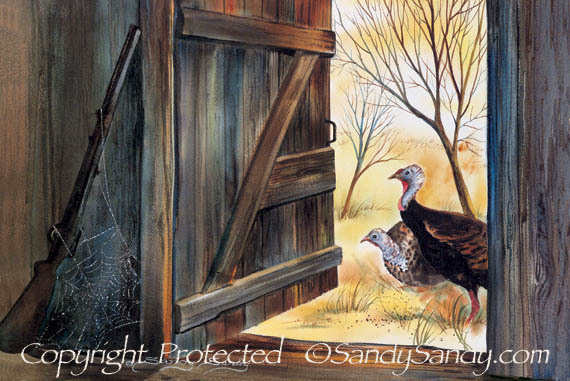 Wild turkeys were on the brink of extinction by the mid point of this century due to loss of habitat and over hunting. Today through the efforts of conservation agencies, the wild turkey is making a strong comeback in many areas of North America. Although highly adaptable, the turkey is essentially a bird of wooded country. Turkeys are large and powerful. The males average around 16.5 pounds and the females around 10 pounds. They may stand 3-4 feet tall when alert. Though they spend most of their time on the ground, these birds roost in trees at night and are capable of swift flight of up to about 45 miles per hour.